Tables lined with bright yellow sticky notes and pages torn out of notebooks covered with ideas; whiteboards covered in black, red, and blue words and pictures; laptops running multiple programs at once, some of which are multitasking themselves. This is what it looks like to create competitive marketing and business plans over the course of three days. 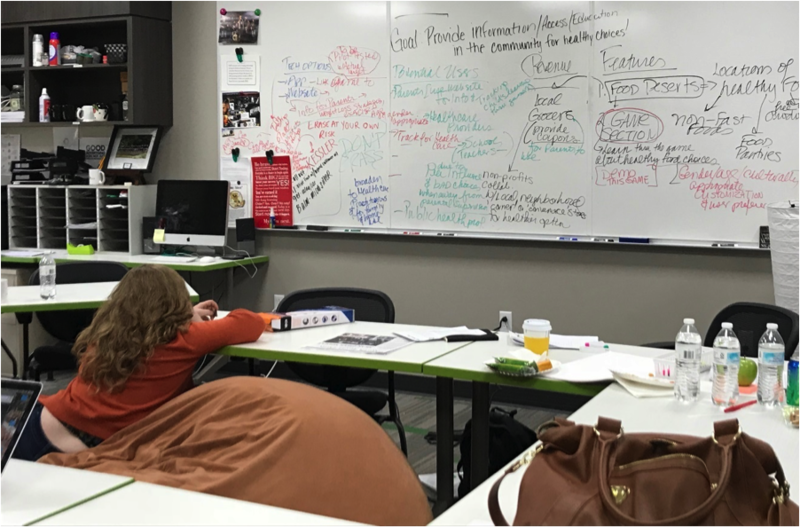 Students participating in the 2017 J-School Hackathon at University of North Texas on Oct. 20-22, 2017, had to do just that, and the process gets tough. For every “great” idea, there are more “good” ones and even more “okay” ones. After hours of thinking, it seems impossible to tell the difference between them all. Participants on teams had to collaborate with strangers from other schools to create a business that could not only survive in the real world, but flourish and make a profit. It was a lot to ask. However, amidst the stress and busy-ness of this year’s Hackathon, the creative process was on full display, finding the “great” ideas and forming them into something the real world could use. Of course, where there was creativity, there was also silliness, fun, and bonding. We did it all at the Hackathon. The students got to know one another, work together, and overcome obstacles they may have never anticipated. When brainstorming, there should be no distractions, especially not physical discomfort. While most teams sat in normal office chairs to do their planning, a member from Team Stethoscope collaborated with her group while sitting in a giant beanbag chair. There is nothing quite as relaxing as sinking down in your seat and talking healthcare. Although they did not know it at the time, Team Stethoscope’s startup idea, HealthDragon, would win the Hackathon competition. Not only is planning in comfort enjoyable, but it paves the way to victory. 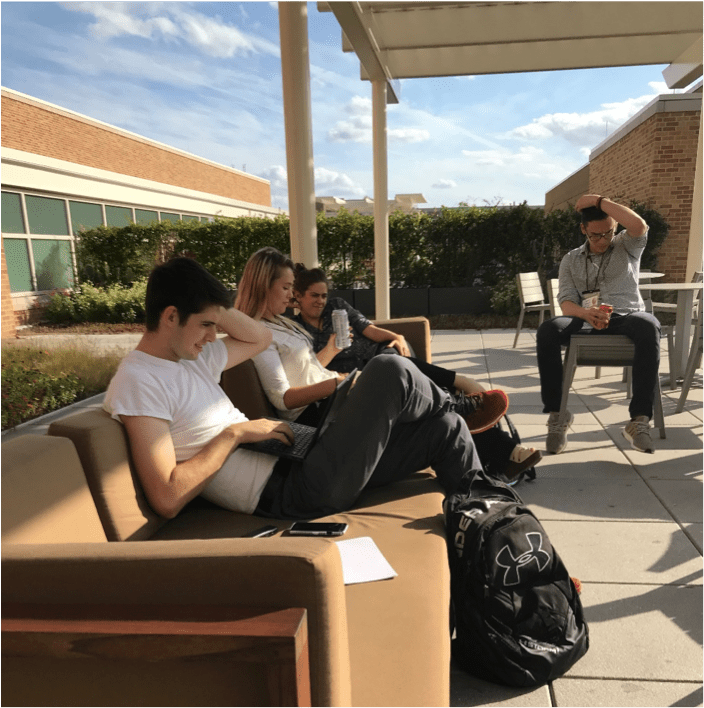 While most of the other teams stayed in their designated rooms in Sycamore Hall, Team Skateboard explored a bit of UNT’s campus and found a peaceful spot on the roof patio of the Student Union building. In the warmth of the sun, the members of Team Skateboard put together their startup idea: SOAR, a site that focused on the stories of women athletes. The peace, warmth, and unconventional atmosphere allowed them to go undisturbed while planning, except, of course, when the media team found them to take pictures (guilty as charged). The most important part of creativity is ensuring that the brain is fully fueled and awake. While the competition went on, snacks were available in the break room. These snacks ranged from healthy and light grapes, to sweet to hearty pretzel bites, to delightful snickerdoodle cookies. Over the course of the three days, the stock of snacks slowly decreased, especially the cookie supply. Group members and their instructors came most, however, to grab a cup of coffee, likely loaded with cream and sugar. Late nights and the constant process of shaping ideas into something that could be real takes its toll on anyone’s alertness; the coffee was much appreciated. To complement their team names, many teams had little toys. Team Bocce had a set of colorful balls, which one of their members often tossed up and caught. Team Reflex Hammer had little light up hammers. And of course, Team Ping Pong had paddles and a ping pong ball. These toys were fun little ways to show how spirited the teams were, as well as provide little boredom breakers. Nothing helped the teams stay motivated like things to keep their hands busy and little breaks to take pictures. Overall, the competition was more than just a competition. The students got to know one another, work together, and overcome obstacles they may have never anticipated. Through the stress and pressure, the Hackathon participants found little slices of fun and friendship. The atmosphere was professional but cordial, and light once the competition was over. Before leaving, many members exchanged social media information to stay in touch across state lines. Although only one group won, many left with valuable lessons and memories that will be hard to forget. Evelyn Gonzalez is a journalism student at the University of North Texas.